Aguanko‘s composer, conguero and bandleader Dr. Alberto Naciffirst stepped into the worlds of Latin and Afro-Cuban percussion alongside Cuban conga/bongo master Armando Peraza, the pillar of percussion fire who blazed throughout the Santanaband’s first decade. On Pattern Recognition, Nacif teams with another legendary Cuban percussionist: José “Pepe” Espinosa, who jumps in on timbales, guiro and bongos, and doubles as producer of Aguanko’s third release. Aguanko’s albums consistently run with the humming, precision consistency of an exquisitely tuned timepiece, and Pattern Recognition is no exception. The opening “Señor Smoke” (mambo) organically blossoms from its introductory bass line, trailing piano, percussion, bass and drum lines all in perfect balance, with horns emerging like flowers blooming off of their rhythmic vines. Muted trumpet sketches a classic Latin big band sound into the subsequent title track (also a mambo). “Doctor’s Orders” (mambo) spotlights extended Latin jazz reflections from pianist Rick Roe and trombone player Christopher Smith, and winks at Dr. Nacif’s “other” profession as a family practitioner who earned his MD from Wayne State University and served as personal physician to Detroit’s esteemed trumpeter Marcus Belgrave. “Metaphorically Speaking” (mambo) burns with even more jazz fever from exhilarating trumpet and trombone solos (and is curiously annotated as Nacif’s nod to Charlie Parker‘s incendiary romp through the Tin Pan Alley classic “[Back Home Again in] Indiana”). In fact, it’s tempting to wonder if Pattern Recogntion runs a little too smoothly. Running together five mambos out of the first six tracks (no matter how excellently conceived and executed) can create a sonic sameness that sparkles and shines but rolls past without pause or differentiation. Even so, it’s a comfortable glide along colorful, beautiful sights and sounds through the kaleidoscopic vision of southeastern Michigan’s beacon of Latin jazz heat and light. Personnel: Alberto Nacif: composer, congas; Jose “Pepe” Espinosa: timbales, guiro, bongo; Patrick Prouty: bass; Rick Roe: piano; Russell Miller: saxophones, flute; Anthony Stanco: trumpet, flugelhorn; Christopher Smith: trombone. 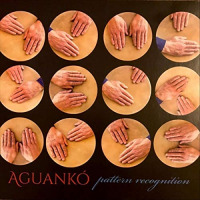 AGUANKO/Pattern Recognition: So who says there can’t be killer Latin jazz from south eastern Michigan? You think they don’t like to party up there? Led by a conga cat with more than Tito Puente aspirations, put this on and watch the gringos get into the spirit of things—with abandon. High octane and sizzling, this is the stuff you know to always show up for. Well done. recommended in the 2017 annual gift guide on Page 15. As the holiday season rolls around every year, many can’t wait to plug into the sounds of Christmas standards interpreted by their favorite artists. Many Latin musicians have tackled this timeless genre, and the best recordings stand the test of time. One notable example: the collection of holiday favorites featured on Latin Jazz Christmas (Concord), a session starring Sheila E., Arturo Sandoval, Ed Calle, Poncho Sanchez and other notables that sounds as fresh today as it did when it was recorded 15 years ago. In the same vein, but fresh off the vine, is Latin Jazz Christmas in Havana (Aguankó Music) by Aguankó, a Michigan-based group fronted by percussionist and composer Alberto Nacif. A native of the Oaxaca region of Mexico who is today a practicing physician in Detroit, Nacif has expanded his knowledge of Latin music idioms through frequent visits to Cuba to study with world class musicians in Havana. A man of many talents, he crafted this 10-track session to showcase a variety of tropical rhythmic styles. He applies them to such seasonal hits as “Santa Baby,” an album highlight, “Sleigh Ride,” “White Christmas” and “It’s Beginning to Look a Lot Like Christmas.” Wisely, Nacif avoids overexposing himself with too many conga drum solos, relying instead on guiding the festive flow of cha-cha, mambo, bolero and guaguancó rhythms – among others – and letting his exceptional pianist, Rick Roe, and a four-man horn section take center stage. The arrangements are harmonically lush and the rhythms will get hips swaying. This is a recording you’ll instantly fall in love with. In 2012, conguero and composer Alberto Nacif, a Mexican native transplanted in Michigan, brought together some of the area’s most skilled Afro-Cuban and Latin musicians to form Aguankó. Their small ensemble with a large Latin jazz sound herewith follows up their self-produced 2013 debut Elemental with a sparkling new set entirely written by Nacif, featuring Aguankó percussionist Jose “Pepe” Espinosa serving for the first time as their producer. There is something undefinably and indescribably joyous about Nacif’s music, the band’s performance, and Espinosa’s production, on Invisible. A sense of collective joy—the joy of creation, the joy of camaraderie and collaboration, and the simple joy of music—bubbles up from the chirping percussion and sunny brass of the opening “Sur La Seine” (mambo) like a refreshing mountain stream. The trombone solo by Christopher Smith flies so fleetly that you ears nearly hear it as a trumpet, but there’s no mistaking the sound of Russell Miller’s saxophone, which teams with the crackling piano solo to turn up the rhythmic flame. A subsequent 6/8 mambo “Luna Roja for Armando Peraza” is an absolute frenzy of brass, piano, and percussion from start to finish; I genuinely don’t understand how someone could remain unmoved by this music. The closing guaguankó “Un Futuro Brillante” (“A Bright Future”) certainly sounds like it. Trumpeter Anthony Stanco combines the bright and blazing best of Latin jazz trumpet legends Dizzy Gillespie and Arturo Sandoval, while Nacif honors the sound and spirit of Afro-Cuban piano firebrand Arturo O’Farrill. Just like “Luna Roja,” this absolute hurricane of melody and rhythm is such inspired, and inspiring, music. Alberto Nacif is also a (General Practitioner) medical doctor, and the music he makes with Aguankó sounds healing, soulful, and life-affirming. Nominated for Ourstanding World Music release by the 2015 Detroit Music Awards, Invisible has thankfully raised Aguankó’s visibility throughout the jazz community. The latest review from Descarga. EditorsPick: Alberto Nacif returns with his critically acclaimed group Aguancó. Nacif, composer, conguero and bandleader, is joined by esteemed Cuban percussionist José “Pepe” Espinosa (timbal, bongo, batá) who adds his islands essential, rich, flavor to everything he engages. There’s enough swing and intelligence packed into these nine tracks to the power this city for a week. Wonderfully composed and tastefully executed, this is mambo-driven dance music at its best. There is a carefully considered balance of rhythmic intensity and understated nuance that is at the core of Nacif’s arrangements. It’s this quality that has resulted in one the most satisfying, unified, albums produced this year. Even the more relaxed-tempo tracks are so infused with sabor and groove that its impossible not to move your body. For example, the title track, Invisible, sung by Alberto Alberto, is a hauntingly beautiful bolero that morphs into a slowly boiling cha-cha-chá. On the other extreme are tracks like Luna Roja for Armando Peraza, a full blown trombone and trumpet-framed party that shines like a beacon of Afro Cuban spirit. Nacif and Espinoza converse percussively in eloquent fashion here. Nice. And, then, guest trumpeter Marcus Belgrave nails it on Señor Belgrave, the danzon-chá. Nacif is a superb conguero who refrains from going over the top. Oh, he can push it. But, like his compositions, he tends to favor a well executed phrase over fireworks simply for fireworks sake. That’s just fine by me. Aguanko’s set included songs written by Nacif from the band’s recent “Elemental” CD on PKO records. It included great alto solos by Russ Miller, the spunky trombone of Chris Smith, the stratospheric trumpet of Paul Finkbeiner, the lively piano of Wesley Reynoso, and above all the cooking rhythms provided by bassist Pat Prouty, the phenomenal percussionist Jose “Pepe” Espinosa, and Nacif himself. Nacif is to be congratulated on this very well-conceived and executed project. His group can be heard regularly at Tio’s in Ann Arbor. 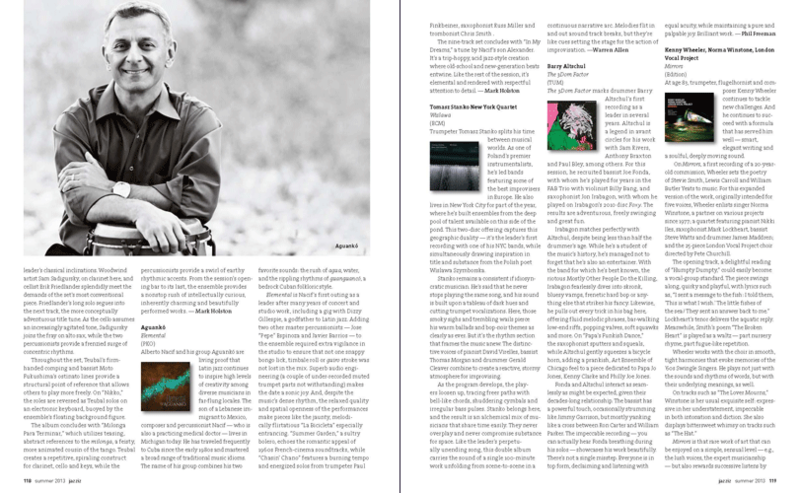 There is much to recommend about “Elemental”. The balance of ballads to bright, catchy tunes is perfect. The photos and graphics are sensitive and elegantly artistic. And, the recording quality is stellar. As I listened, I recalled the crystalline audio quality of Dizzy Gillespie’s “Fiesta Mojo”. Try the comparison and I think you’ll hear what I mean. I think you’ll hear “Elemental” by Aguankó on WEMU for years to come. – Linda Yohn, WEMU, 2013.